To Cite: Falahati M, Fateh R, Nasiri A, Zaini F, Fattahi A, et al. Specific Identification and Antifungal Susceptibility Pattern of Clinically Important Dermatophyte Species Isolated from Patients with Dermatophytosis in Tehran, Iran, Arch Clin Infect Dis. 2018 ; 13(3):e63104. doi: 10.5812/archcid.63104. Background: With regard to the increasing number of antifungal-resistant dermatophytes, the requirement for precise identification of causative agents of infections and antifungal susceptibility test is vital. Antifungal susceptibility testing of dermatophytes plays a pivotal role in managing dermatophytosis. The current study aimed at determining antifungal susceptibility profile of 161 important dermatophyte species isolated from Iranian patients. Methods: The current descriptive, cross sectional study was conducted on 508 clinically suspected samples of dermatophytosis collected and identified by conventional methods. All dermatophyte isolates were identiﬁed using polymerase chain reaction-restriction fragment length polymorphism (PCR-RFLP) method. The susceptibility of dermatophyte strains to two routine antidermatophyte agents (terbinafine and griseofulvin) was evaluated using micro-dilution method according to CLSI (the clinical and laboratory standards institute) M38-A2 guidelines. Trichophyton rubrum PTCC 5143 and Candida krusei ATCC 6258 were used as quality controls. Results: Among 161 dermatophyte isolates, T. interdigitale was reported as the most frequent species isolated from patients using PCR-RFLP and Microsporum ferruginum was the least isolated species. The minimum inhibitory concentration (MIC) values of griseofulvin and terbinafine were ranged 0.0312 - 8 and 0.008 - 4 µg/mL, respectively. The most susceptible and resistant species to griseofulvin were T. interdigitale (MIC = 0.0312 µg/mL) and T. interdigitale/T. rubrum (MIC = 8 µg/mL), respectively. The results indicated that T. verrucosum (MIC = 0.008 µg/mL) was the most susceptible species to terbinafine, whereas T. interdigitale and T. rubrum were the most resistant species to it (MIC = 4 µg/mL). Conclusions: The obtained results assist clinicians to monitor the trend and be able to choose effective medications to treat patients with dermatophytosis, especially in countries such as Iran, where dermatophytosis is still a public health problem. In the last two decades, infections caused by dermatophyte species are remarkable public health problems due to the increasing number of cases, particularly in immunocompromised patients (1). Since the traditional methods are slow and non-specific diagnostic tools to differentiate dermatophyte species and many isolates have atypical features in primary isolation, a variety of molecular techniques are designed for precise differentiation of dermatophyte isolates (2, 3). Dermatophytosis is generally treated with topical antifungal drugs, with the exception of disseminated or nails infections. Therapeutic results vary depending on site of the infection and the causative agent (4). A number of antifungal agents are recommended to treat all types of infections (5). Griseofulvin and terbinafine were considered as the best treatment-of-choice for dermatophytosis (6); 70% - 100% efficacy is documented for griseofulvin (6-8) and it is reported that terbinafine provides long-term clinical efficacy and lower relapse (9). However, dermatophyte species causing onychomycosis do not respond well to treatments (10), it may be due to drug resistant of causative agents, peripheral vascular disease, fungal growth patterns, and the presence of dormant fungal spores (arthrospores) in the nail (11). In vitro analysis of the antifungals activity provides the possibility to compare the efficacy of different drugs; however, determination of susceptibility pattern helps to develop or select appropriate drug regimens. There are few studies about activity of antifungal drugs against dermatophyte species in several regions of Iran (5, 10, 12-16); hence, the current study aimed at assessing in vitro activities of griseofulvin and terbinaﬁne against molecular identified dermatophytes using broth microdilution method. All patients with dermatophytosis symptoms were enrolled in the study, irrespective of their age and gender. All patients signed a consent form. The patients who received any antifungal drugs in the past four weeks were excluded from the study. Patients’ demographic data, such as age and gender were obtained. A total of 508 clinically suspected specimens including skin, nail, and hair were collected from patients referred to Razi hospital, Tehran, Iran. After culturing the specimens, all dermatophyte isolates were primarily identified using conventional methods. Genomic DNA was extracted using DNG-Plus kit (SinaClon, Iran). Specific identification of species was performed using polymerase chain reaction-restriction fragment length polymorphism (PCR-RFLP) method. After extracting DNA from the clinical isolates, the ITS1-5.8SrDNA-ITS4 region was amplified using ITS1 (TCCGTAGGTGAACCTGCGG) and ITS4 (TCCTCCGCTTATTGATATGC) primers (3). 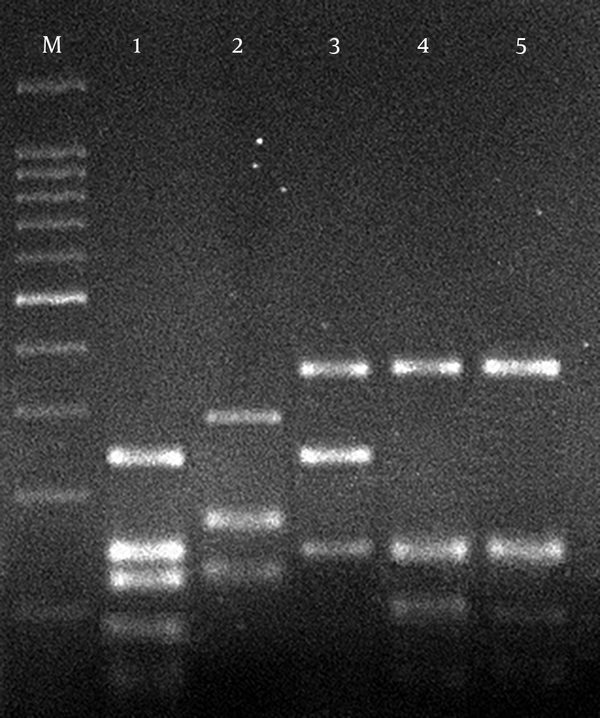 In the preliminary screening, all amplicons were digested with the restriction enzyme Mva I (3). To identify isolates with similar RFLP pattern, two additional restriction enzymes, BsrF I and Mae III were used to differentiate Trichophyton tonsurans/T. equinum and M. canis/M. ferrugineum, respectively (17). The digested products were analyzed on 2% agarose gel. Griseofulvin and terbinafine (Sigma-Aldrich, St. Louis, MO, USA) powders were dissolved in 100% dimethyl sulfoxide (Sigma-Aldrich, St. Louis, MO, USA) according to CLSI (the Clinical and Laboratory Standards Institute) broth microdilution protocol (18, 19) and diluted in standard RPMI medium (Roswell Park Memorial Institute 1640) buffered to pH 7.0 with 0.165 M/L morpholinepropanesulfonic acid buffer (MOPS) with L-glutamine without bicarbonate (Sigma-Aldrich, St. Louis, MO, USA). The ﬁnal concentrations of griseofulvin and terbinafine in 96-well microplates ranged 64 to 0.125 and 4 to 0.008 µg/mL, respectively (19). Inoculum suspensions of fungi were prepared from 10 to 14-day-old cultures grown on potato dextrose agar (Merck, Germany) at 30°C. Then surface of colonies were covered with 5 mL of sterile saline (0.85%) and scraped by tip of a sterile swab and mixture collected in sterile tubes. The tubes were placed at room temperature for 15 to 20 minutes to remove heavy particles such as hyphae. Homogeneous conidial suspensions were transferred to new sterile tubes and turbidity was measured using spectrophotometer (Jenway Model 6305) at a wavelength of 530 nm, to optical densities (ODs) 65% transmission. Final inoculum concentration (1 - 3 × 103 CFU/mL) was obtained by diluting 1:50 to 1:100 in RPMI 1640 (19). A 100-µL of the diluted inoculum suspension was aliquot to each well. The microplates were incubated at 30°C, and were visually read after seven days of incubation. The MIC was deﬁned as the point at which the organism was inhibited 80% for terbinafine and griseofulvin, in comparison with positive control (19). T. rubrum PTCC 5143 and C. krusei ATCC 6258 were used as quality controls. MIC range, MIC50, and MIC90 were calculated for all the isolates using SPSS version 19. Totally, 161 positive cases of dermatophytosis- 88 (54.7%) male and 73 (45.3%) female- were identified. The age of the study group ranged 4 to 84 years (mean 43.9). Majority of the patients were within the age range of 41 - 50 years (27.3%), followed by 31 - 40 years (16.8%). All primarily identified dermatophytes were precisely differentiated using PCR-RFLP (Table 1). All species of T. verrucosum (n = 5) identified by the routine laboratory method were reported as T. interdigitale using molecular method. In the primary screening by ITS (internal transcribed spacer)-RFLP with Mva I, T. interdigitale (n = 73), T. rubrum (n = 45), E. floccosum (n = 23), M. gypseum (n = 4), and T. violaceum (n = 2) were identified (Figure 1). In the secondary RFLP using BsrF I, four isolates were identified as T. tonsorans. Among 10 strains digested by Mae III, nine isolates were identified as M. canis and one as M. ferrugineum. Results obtained from the current study showed high potency of terbinafine against all dermatophyte species. A significant sensitivity to terbinafine was reported in T. verrucosum (MIC = 0.008 µg/mL), whereas T. interdigitale and T. rubrum were the most resistant species (MIC = 4 µg/mL) (Table 2). As shown in Table 2, the most susceptible and resistant species to griseofulvin were T. interdigitale (MIC = 0.0312 µg/mL) and T. verrucosum/T. interdigitale (MIC = 8 µg/mL), respectively. Abbreviations: GRIS; griseofulvin, TRB; terbinafine. MIC50 and MIC90 for two antidermatophytic agents were calculated (Table 3). Abbreviations: GM; geometric mean, GRIS; griseofulvin, MIC; minimal inhibitory concentration, TRB; terbinafine. Identification of dermatophytes at the species level is an essential factor to treat patients. Identification of this closely related group of fungi is classically based on phenotypic and physiological characteristics (19). Therefore, due to the high degree of morphological similarity between several dermatophyte species, identification mistakes are inevitable. Several molecular methods are developed for precise identiﬁcation of dermatophyte species, but it seems that PCR-RFLP analysis is a promising, rapid, easy, and cost-effective method. In the current study, a virtual and practical PCR-RFLP assay, targeting the ITS-rDNA region, was used to differentiate common pathogenic dermatophyte species. The results obtained from the current study confirmed that molecular assay was more reliable than conventional method to differentiate several species (Table 1). It is based on the fact that the traditional methods were unable to differentiate T. verrucosum and T. mentagrophytes strains, whereas the molecular method differentiated these strains, precisely. Similar previous studies from Iran were reported as the predominant causative agent (16, 17, 20). The reproducible and reliable antifungal susceptibility testing are required due to the increasing number of dermatophytosis, the frequent use of antifungal agents, and the resulting drug resistance as an important clinical problem. In vitro susceptibility testing is useful to select more clinically active agents and plays an essential role to determine the emerging resistance patterns. In vitro antifungal susceptibility testing is now developed for filamentous and yeast fungi, but is not used as a routine technique to evaluate antifungal activity of several components against dermatophytes (21). Several investigations show considerable variation in susceptibility of dermatophytes to antifungal drugs that is probably due to methodological differences among the several research centers. In the current study, CLSI M38-A2 was used to determine the MIC values of the two antifungal agents. According to the MIC breakpoints proposed by CLSI, relatively low levels of terbinafine resistance were observed in dermatophyte strains, proving that this drug encompasses suitable activity on a variety of clinical strains. In the current study, MICs of terbinafine showed a variable range of activity on the different species of Microsporum (0.0156 - 0.25 µg/mL), Trichophyton (0.008 - 4 µg/mL) and Epidermophyton (0.125 - 2 µg/mL). The results obtained from the current study highlighted the use of terbinafine for the majority of dermatophytosis cases especially in infections caused by species resistant to griseofulvin. This finding was in agreement with the results of several previous investigations (11, 12, 22-25). In a study by Perea et al. (26), terbinafine indicated less activity against the tested isolates. The possible reasons for these differences may be due to time and temperature of incubation and other technical errors. In the current study the geometric mean (Gm) MIC of terbinafine for T. interdigitale, was lower than that of Ansari et al. (16) and comparable to that of Jo Siu et al. (27). In cases of T. rubrum and E. floccosum, the Gm MIC of terbinafine was lower than those of the studies by Esteban et al. (28), and Adimi et al. (12), respectively. However, the Gm MIC of terbinafine for T. rubrum and E. floccosum was higher than those of Ansari et al. (16). Among nine species of dermatophytes isolated from nail infections, T. interdigitale and T. rubrum had the lowest susceptibility to terbinafine. It is a warning that uncontrolled use of this drug might result in increasing unresponsiveness in the future. Despite the good results of griseofulvin against dermatophyte species, this medicine is not routinely prescribed to treat systemic dermatophytosis (8). In the current study, the MIC of griseofulvin against 161 isolates ranged 0.0312 to 1 μg/mL. The obtained results supported the ﬁndings of previous studies, which reported good activity of griseofulvin against various dermatophytes (12, 14, 29). Data indicated that T. interdigitale was more susceptible to griseofulvin (MIC90, 0.25 µg/mL) than the other tested species. Griseofulvin showed reduced susceptibility to T. rubrum (MIC90, 2 µg/mL). The results obtained in the current study were in agreement with those of other studies (10, 12, 26) demonstrating that susceptibility to griseofulvin varied among the species. The Gm MIC of griseofulvin reported in the current study was lower than those of the previous studies (12, 16, 29). Furthermore, 6% of strains showed resistance to griseofulvin. Decreased susceptibility to griseofulvin was reported in the studies by Galuppi et al., (MICs ranging 4 to 8 µg/mL) and Scholz et al. (MICs, 3 µg/mL) (29, 30). In the literature, resistance to griseofulvin was described for T. rubrum (26, 31). The current study results can assist clinicians to monitor the trend and choose effective medications to treat patients with dermatophytoses, especially in countries such as Iran where dermatophytoses is a public health problem. On the other hand, terbinafine showed excellent in vitro activity against dermatophyte isolates. It seems to be a promising therapeutic choice when other therapeutic options such as griseofulvin are eliminated by the increasing resistance. Funding/Support: The current study was financially supported by Iran University of Medical Sciences, Tehran, Iran (grant No. 4). 1. Bhatia VK, Sharma PC. Determination of minimum inhibitory concentrations of itraconazole, terbinafine and ketoconazole against dermatophyte species by broth microdilution method. Indian J Med Microbiol. 2015;33(4):533-7. doi: 10.4103/0255-0857.167341. [PubMed: 26470960]. 2. Bhatia VK, Sharma PC. Epidemiological studies on Dermatophytosis in human patients in Himachal Pradesh, India. Springerplus. 2014;3:134. doi: 10.1186/2193-1801-3-134. [PubMed: 25674437]. [PubMed Central: PMC4320242]. 3. Rezaei-Matehkolaei A, Makimura K, Shidfar M, Zaini F, Eshraghian M, Jalalizand N, et al. Use of Single-enzyme PCR-restriction Digestion Barcode Targeting the Internal Transcribed Spacers (ITS rDNA) to Identify Dermatophyte Species. Iran J Public Health. 2012;41(3):82-94. [PubMed: 23113152]. [PubMed Central: PMC3481703]. 4. Fernandez-Torres B, Carrillo AJ, Martin E, Del Palacio A, Moore MK, Valverde A, et al. In vitro activities of 10 antifungal drugs against 508 dermatophyte strains. Antimicrob Agents Chemother. 2001;45(9):2524-8. [PubMed: 11502524]. [PubMed Central: PMC90687]. 5. Chadeganipour M, Nilipour S, Havaei A. In vitro evaluation of griseofulvin against clinical isolates of dermatophytes from Isfahan. Mycoses. 2004;47(11-12):503-7. doi: 10.1111/j.1439-0507.2004.01050.x. [PubMed: 15601457]. 6. Roberts BJ, FriedIander SF. Tinea Capitis: A Treatment Update. PediatrAnn. 2005;34(3):191-200. doi: 10.3928/0090-4481-20050301-08. 7. Gupta AK, Williams JV, Zaman M, Singh J. In vitro pharmacodynamic characteristics of griseofulvin against dermatophyte isolates of Trichophyton tonsurans from tinea capitis patients. Med Mycol. 2009;47(8):796-801. doi: 10.3109/13693780802712523. [PubMed: 19212895]. 8. Fuller LC, Smith CH, Cerio R, Marsden RA, Midgley G, Beard AL, et al. A randomized comparison of 4 weeks of terbinafine vs. 8 weeks of griseofulvin for the treatment of tinea capitis. Br J Dermatol. 2001;144(2):321-7. [PubMed: 11251566]. 9. Lupi O, Tyring SK, McGinnis MR. Tropical dermatology: fungal tropical diseases. J Am Acad Dermatol. 2005;53(6):931-51. quiz 952-4. doi: 10.1016/j.jaad.2004.10.883. [PubMed: 16310053]. 10. Pakshir K, Bahaedinie L, Rezaei Z, Sodaifi M, Zomorodian K. In vitro activity of six antifungal drugs against clinically important dermatophytes. Jundishapur J Microb. 2009;2(4):158-63. 11. da Silva Barros ME, de Assis Santos D, Hamdan JS. Evaluation of susceptibility of Trichophyton mentagrophytes and Trichophyton rubrum clinical isolates to antifungal drugs using a modified CLSI microdilution method (M38-A). J Med Microbiol. 2007;56(Pt 4):514-8. doi: 10.1099/jmm.0.46542-0. [PubMed: 17374893]. 12. Adimi P, Hashemi SJ, Mahmoudi M, Mirhendi H, Shidfar MR, Emmami M, et al. In-vitro activity of 10 antifungal agents against 320 dermatophyte strains using microdilution method in Tehran. Iran J Pharm Res. 2013;12(3):537. 13. Noorbakhsh F, Rezaie S, Shahverdi AR. Antifungal effects of silver nanoparticle alone and with combination of antifungal drug on dermatophyte pathogen Trichophyton rubrum. International conference on bioscience, biochemistry and bioinformatics. 2011. p. 364-7. 14. Mikaeili A, Modaresi M, Karimi I, Ghavimi H, Fathi M, Jalilian N. Antifungal activities of Astragalus verus Olivier. against Trichophyton verrucosum on in vitro and in vivo guinea pig model of dermatophytosis. Mycoses. 2012;55(4):318-25. doi: 10.1111/j.1439-0507.2011.02090.x. [PubMed: 21838718]. 15. Massiha A, Muradov PZ. Comparison of Antifungal Activity of Extracts of Ten Plant Species and Griseofulvin Against Human Pathogenic Dermatophytes. Zahedan J Res Med Sci. 2015;17(10). doi: 10.17795/zjrms-2096. 16. Ansari S, Hedayati MT, Zomorodian K, Pakshir K, Badali H, Rafiei A, et al. Molecular Characterization and In Vitro Antifungal Susceptibility of 316 Clinical Isolates of Dermatophytes in Iran. Mycopathologia. 2016;181(1-2):89-95. doi: 10.1007/s11046-015-9941-y. [PubMed: 26369643]. 17. Rezaei-Matehkolaei A, Makimura K, de Hoog S, Shidfar MR, Zaini F, Eshraghian M, et al. Molecular epidemiology of dermatophytosis in Tehran, Iran, a clinical and microbial survey. Med Mycol. 2013;51(2):203-7. doi: 10.3109/13693786.2012.686124. [PubMed: 22587730]. 18. Wayne P. Clinical and Laboratory Standards Institute: Reference method for broth dilution antifungal susceptibility testing of yeasts; approved standard. CLSI document M27-A3 and Supplement S. 2008;3:6-12. 19. Wayne P. Clinical and Laboratory Standards Institute: Reference method for broth dilution antifungal susceptibility testing of filamentous fungi; approved standard. CLSI document M38-A2. CLSI. 2008;2:6-12. 20. Abastabar M, Rezaei-Matehkolaei A, Shidfar MR, Kordbacheh P, Mohammadi R, Shokoohi T, et al. A Molecular Epidemiological Survey of Clinically Important Dermatophytes in Iran Based on Specific RFLP Profiles of Beta-tubulin Gene. Iran J Public Health. 2013;42(9):1049-57. [PubMed: 26060667]. [PubMed Central: PMC4453885]. 21. Arikan S. Current status of antifungal susceptibility testing methods. Med Mycol. 2007;45(7):569-87. doi: 10.1080/13693780701436794. [PubMed: 17885947]. 22. Silva LB, de Oliveira DB, da Silva BV, de Souza RA, da Silva PR, Ferreira-Paim K, et al. Identification and antifungal susceptibility of fungi isolated from dermatomycoses. J Eur Acad Dermatol Venereol. 2014;28(5):633-40. doi: 10.1111/jdv.12151. [PubMed: 23556501]. 23. Carrillo-Munoz AJ, Giusiano G, Cardenes D, Hernandez-Molina JM, Eraso E, Quindos G, et al. Terbinafine susceptibility patterns for onychomycosis-causative dermatophytes and Scopulariopsis brevicaulis. Int J Antimicrob Agents. 2008;31(6):540-3. doi: 10.1016/j.ijantimicag.2008.01.023. [PubMed: 18367383]. 24. Bueno JG, Martinez C, Zapata B, Sanclemente G, Gallego M, Mesa AC. In vitro activity of fluconazole, itraconazole, voriconazole and terbinafine against fungi causing onychomycosis. Clin Exp Dermatol. 2010;35(6):658-63. doi: 10.1111/j.1365-2230.2009.03698.x. [PubMed: 19874354]. 25. Ataides FS, Chaul MH, El Essal FE, Costa CR, Souza LK, Fernandes OF, et al. Antifungal susceptibility patterns of yeasts and filamentous fungi isolated from nail infection. J Eur Acad Dermatol Venereol. 2012;26(12):1479-85. doi: 10.1111/j.1468-3083.2011.04315.x. [PubMed: 22049990]. 26. Perea S, Fothergill AW, Sutton DA, Rinaldi MG. Comparison of in vitro activities of voriconazole and five established antifungal agents against different species of dermatophytes using a broth macrodilution method. J Clin Microbiol. 2001;39(1):385-8. doi: 10.1128/JCM.39.1.385-388.2001. [PubMed: 11136808]. [PubMed Central: PMC87739]. 27. Jo Siu WJ, Tatsumi Y, Senda H, Pillai R, Nakamura T, Sone D, et al. Comparison of in vitro antifungal activities of efinaconazole and currently available antifungal agents against a variety of pathogenic fungi associated with onychomycosis. Antimicrob Agents Chemother. 2013;57(4):1610-6. doi: 10.1128/AAC.02056-12. [PubMed: 23318803]. [PubMed Central: PMC3623347]. 28. Esteban A, Abarca ML, Cabanes FJ. Comparison of disk diffusion method and broth microdilution method for antifungal susceptibility testing of dermatophytes. Med Mycol. 2005;43(1):61-6. doi: 10.1080/13693780410001711972. 29. Galuppi R, Gambarara A, Bonoli C, Ostanello F, Tampieri MP. Antimycotic effectiveness against dermatophytes: comparison of two in vitro tests. Vet Res Commun. 2010;34 Suppl 1:S57-61. doi: 10.1007/s11259-010-9386-1. [PubMed: 20490661]. 30. Scholz R, Meinhof W. Susceptibility of Trichophyton rubrum to griseofulvin. Mycoses. 2009;34(9-10):411-4. doi: 10.1111/j.1439-0507.1991.tb00804.x. 31. Korting HC, Ollert M, Abeck D. Results of German multicenter study of antimicrobial susceptibilities of Trichophyton rubrum and Trichophyton mentagrophytes strains causing tinea unguium. German Collaborative Dermatophyte Drug Susceptibility Study Group. Antimicrob Agents Chemother. 1995;39(5):1206-8. [PubMed: 7625820]. [PubMed Central: PMC162715].